Good Cheer Food Bank serves an average of 850 families a month (more in the winter months) in an environment which provides clients with healthy food choices (including fresh, locally grown produce) in a grocery store-like setting which preserves client dignity. We are proud to be a model Food Bank for our region. Good Cheer uses an innovative “points” shopping system. A one-person household receives 70 points, and 10 more points are allotted for every additional person. A four-person family would receive 100 points per month to spend on supplemental groceries. Q: When is the Food Bank open? A: The Food Bank at Bayview is open six days a week: Mondays 9:30 a.m. to 4:30 p.m.; Tuesdays noon to 7 p.m.; and Wednesdays through Saturday from 9:30 a.m. to 4:30 p.m. Reserved Food Bank parking is located directly to the side of the food bank in marked spaces. Handicapped parking is available directly in front of the Food Bank in marked handicapped spaces. Q: Who uses the Food Bank? A: People in a wide variety of life situations access the Food Bank. Some are seniors on fixed incomes… some are families having trouble making ends meet… some have lost employment and need short-term help while they search for work… some are homeless… some are on permanent disability. We serve people living within our service area of South Whidbey up to parts of Greenbank. Q: How does a person access the Food Bank? A: Just show up. New clients are greeted at the check-in desk and asked for a piece of official mail that shows their name and home address on South Whidbey. If they do not have a permanent address, they are noted as homeless. The only other information needed is how many people are living in the household and their ages. Good Cheer does not ask for proof of income because Food Lifeline and Northwest Harvest who provide thousands of pounds of free food to us do not allow that to be a part of our determination process. We also would not have access to such private information without spending money on the verification process. That would be money not going to food. Once all the information is entered in our database, the client is given a certain amount of points to use in the Food Bank. Clients are given a base of 70 points, plus ten extra points for every member of the household up to 50 points for a total maximum of 120 points to use per month. For instance, a family of four would receive 100 points a month to spend on selection of food in the Food Bank. The food in the Food Bank is assigned a point value which is determined by nutrition and cost. There are also limits placed on items such as chicken, eggs, and peanut butter so we can be sure to have enough for everyone who comes to the Food Bank. The higher the nutritional value, the lower the points, which is our way to encourage healthier eating. 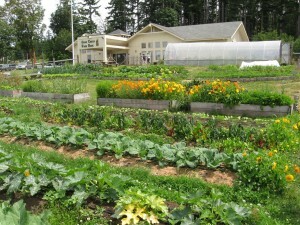 For example, fresh organic produce from our garden will have a lower point value than a can of processed chili. Our goal is to provide enough nutrition for a person to be able to eat all month long. Q: Where does the food come from? A: Some of it comes in as a result of food drives through churches, schools, civic organizations, clubs and private businesses. Contributions, along with proceeds from Good Cheer’s two thrift stores (which provide about 67 percent of the Food Bank’s budget) are used to buy food through several purchasing programs open to area Food Banks. Every dollar Good Cheer spends in buying food from a regional food bank network has the equivalent buying power of $9. And we are proud to say that more than 5,000 pounds of fresh, pesticide-free produce is grown every year – right on the grounds of our Food Bank in the Good Cheer Garden. 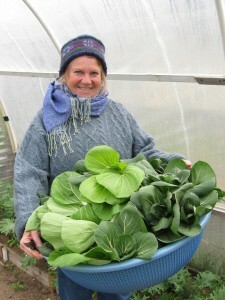 In addition, we have agreements with a local organic farm to supply winter vegetables to the Food Bank through our Fresh Food On the Table program, funded by community donors. Q: How often can a person receive food? A: You may visit as often as you wish as long as you stay within the allotted points for the month. Good Cheer is designed to supplement a person’s regular food supply. However, if your need is urgent, come talk with us, and we’ll work something out. We don’t turn anyone away hungry. Q: How can a person help support Good Cheer? A: We welcome and need volunteers, food donations, monetary donations, and items donated to Good Cheer’s Thrift Stores. We also appreciate patronage of the thrift stores. 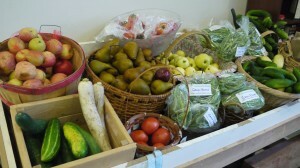 In addition, the Food Bank welcomes donations of surplus fresh garden produce, fruit, and clean, dated eggs in cartons. Q: How do I find the Food Bank?